Place the stock into a large saucepan over medium heat and bring to the boil. Gradually whisk the polenta into the stock. Cook, stirring, for 2-3 minutes, or until thickened. Remove from heat, add the butter, parmesan, herbs, a good pinch of sea salt and some freshly ground black pepper. Stir to combine. Spoon into a 9” x 13” [23 x 33 cm] lightly greased baking pan and spread to ½-inch [1-cm] thick. Refrigerate for 30 minutes or until set. Preheat oven to 425°F [220°C]. 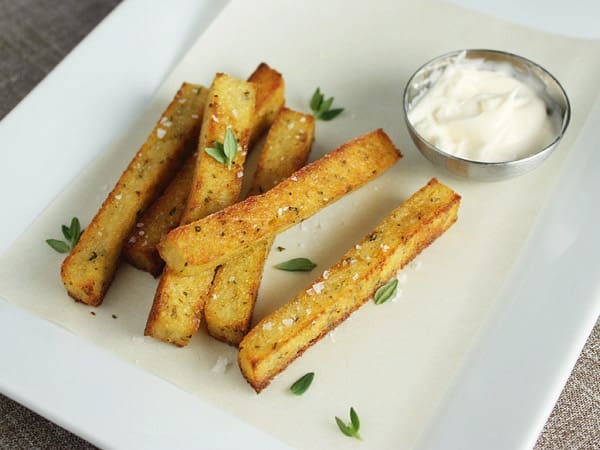 Cut the polenta into ½” x 4” [2 x 10 cm] fries and brush lightly with oil. Place on a lightly greased baking tray and bake for 20-25 minutes, rotating the fries halfway through, until golden and crisp. Serve with mayo or aïoli.